Nona Hershey’s “All of the Above,’’ from her show of the same name at Soprafina Gallery. It’s a big month for Nona Hershey, who has two solo shows of her mixed media drawings up at Trustman Art Gallery at Simmons College and Soprafina Gallery. She will be in a group show later this month at the Schoolhouse Gallery in Provincetown. 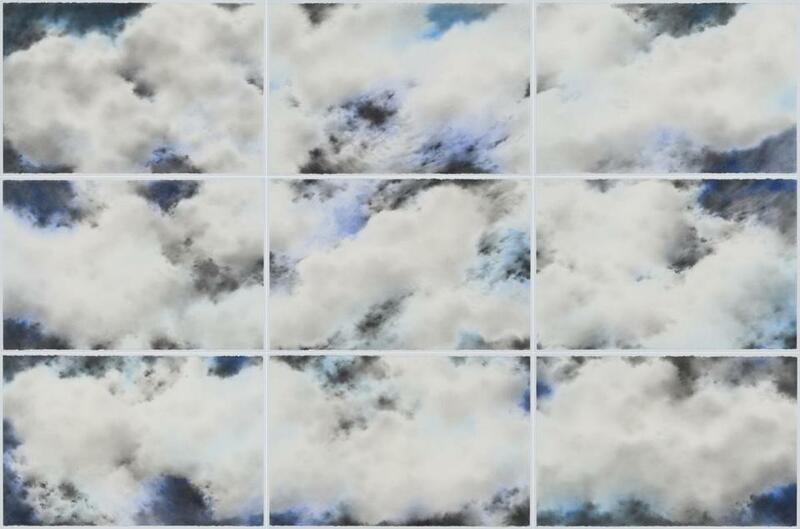 Working with watercolor and graphite powder applied with cotton swabs, Hershey depicts cloud-filled skies that thematically hark back to J.M.W. Turner and Albert Bierstadt. She depicts the sky as a metaphor for spiritual unrest and awakening, a limitless space clotted with operatic cloud cover and shot with light and color. “All of the Above,’’ a three-by-three grid of drawings at Soprafina, conveys the sweeping complexity of Hershey’s atmospherics. Clouds bump along the surface, with breaths of black behind them, over a glowing ground that moves from periwinkle to aqua. The lumbering clouds muffle the luminous sky. There’s momentum in the weather’s motion, and tension in breaking the sky into a grid. 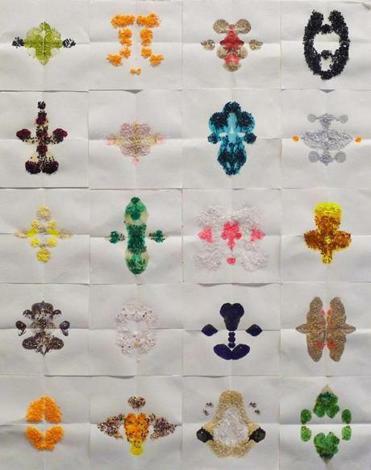 A piece from Kathleen O’Hara’s “Glimmer Rorschachs” series. In most of the works in both shows, Hershey adds another layer that jumps off the surfaces of these moldering contemplations of endless space. The five-part drawing “Can You Hear Me Now” at Simmons features neon orange and pink wisps and tangles. They blossom like electrified dandelions around linear forms that must be satellites conducting wireless communication. They look viral. The colors seep into the clouds behind them, but there’s a sharp edge between the naturalistic sky and the buzzy bright forms that skitter across its surface. The Simmons show winks back through Hershey’s career to a series of monoprints she made in 1989 depicting cables hanging against the ancient walls of Rome. These works are more anchored and gritty, but they share with the drawings the crisp contrast of line whipsawing over layers of ground. Hershey adds yet another layer in pieces such as “Sphere,” at Soprafina. A diagram for how to draw a sphere etched into a sheet of translucent, poison green acrylic perches beside a cloud drawing, to which she has added echoing arcs and angles from the diagram in an upper corner. It looks like the axle around which weather patterns revolve. But it’s also an imposition of human understanding upon the heavens, as if to remark on how loud knowledge can be, and how limiting. NK Gallery closes this month after nearly three years, so that owners Kathy Halamka and Natacha Sochat can pursue new endeavors, according to Halamka. Both are new farmers. Sochat is raising chickens in North Ware, and Halamka has an alpaca farm in Sherborn. The gallery goes out with an elegant two-person show, “Cut and Glitter,’’ organized by Beth Kantrowitz of bkprojects. Randal Thurston's black cut-paper pieces, such as the ornate and creepy “Counting House,” make a delicious counterpoint to Kathleen O’Hara's “Glitter Rorschachs” series, which feature grids of bright little blots on paper. The symmetrical “Counting House” looks like an elaborate design that might embellish architecture or porcelain, and it features crossed pistols, skulls, and howling silhouettes. The “Glitter Rorschachs,” each glittery blot also symmetrical, have a do-it-yourself greeting-card feel that brings to mind both Martha Stewart and second-grade art class, but the reference to inkblot diagnostics suggests darker motivations beneath the pretty veneer. Anthony Greaney, maybe more than any other commercial gallerist in Boston, keeps up with the young artists nurtured by the local art schools. Recently, he’s been staging performances featuring some of them, and now he’s mounted an exhibit with work by Dead Art Star and Lucy Watson. Watson starts with stuffed animals and dolls. She’ll stitch many of them together into plush totems that for all their smiley faces, big eyes, and bright colors, can sometimes feel strangely violent. Some are wickedly effective, others just look like a pile of toys on a 6-year-old girl’s bed. Watson’s “Dora” is simpler and more open-ended: She garbs a giant Dora the Explorer doll in a fuzzy ladybug outfit made for a toddler. Dora’s hair is a mess; she has a smudge of white paint on her face. She holds her pudgy little hand in a welcoming gesture above a puddle of blue plastic, like a baby shaman inviting us to jump down the rabbit hole. Dead Art Star offers several moody, noir-ish Polaroids (and similar instant photos made with a Fuji camera) documenting his community of young musicians and artists. A couple in drag cuddle up to a gravestone. A woman is veiled in cigarette smoke. As snapshots in an analog medium, they’re already imbued with nostalgia. Plus they’re hazy and small — the Fuji prints are in a rectangular format that is probably only 1½-by-2 inches — so there's a sense of glimpsing these scenes through a keyhole. Dead Art Star's photos don’t so much capture his friends and their lifestyle as distill them into something funny and daring and sweet, as if his youth has already passed.